Ultra Trail Chismes-Dolpo© (UTCD) and Ultra Trail Chismes Annapurna© (UTCA). Krishnashtami is the birthday of Lord Krishna the hero of the Hindu epic Mahabharata. 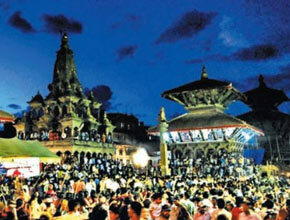 Devotees ﬂock to the ancient Krishna temple in Patan Durbar Square to worship and receive blessings. It is celebrated across the country at the temples of lord Krisna. In Kathmandu, decorated statues and pictures of Lord Krishna are displayed at many places. New Load-shedding Schedule June 27, 2012. Save water, Drink a beer !